Volkswagen Passat Alltrack Performance, Engine, Ride, Handling | What Car? Even with the added weight of the standard-fit four-wheel drive, the entry-level 148bhp 2.0-litre diesel is more than man enough for the task. It’s no ball of fire, but the engine pulls strongly from low rpm, and is refined and easily strong enough to get a full car up to motorway speeds without too much fuss. A six-speed manual is the only gearbox available - no bad thing as it’s light and precise. If you want an automatic gearbox, or just fancy a bit more shove, the other engine on offer is another 2.0-litre diesel but this time with 187bhp. This comes exclusively with a six-speed dual-clutch auto that proves smooth in the majority of situations, only hesitating if you ask for a particularly rapid launch from standstill. This engine certainly feels stronger, but there’s no additional towing capacity. Even so, being able to drag a 2200kg braked trailer should be enough for a particularly big caravan or car trailer. Just bear in mind that the 187bhp diesel isn’t quite as refined as the 148bhp variant and it’ll be costlier to run. In either variant, you’ll find that there isn’t much engine and wind noise at speed, but the big wheels do generate some road noise. The handling is much the same as the regular Passat but with even more of a focus on comfort. 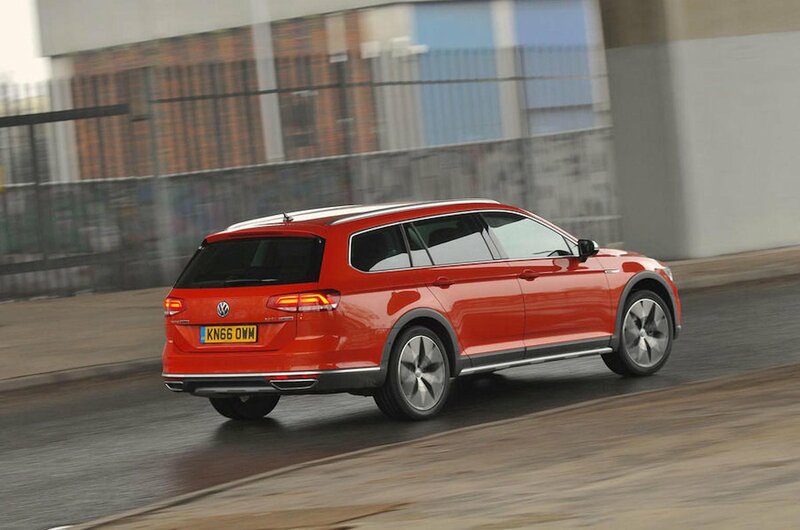 So far we’ve only tried an Alltrack with the optional adaptive dampers that provide a relaxed, if slightly floaty, gait in Comfort mode, a bit more body control in Normal mode and good resistance to body lean in Sport. 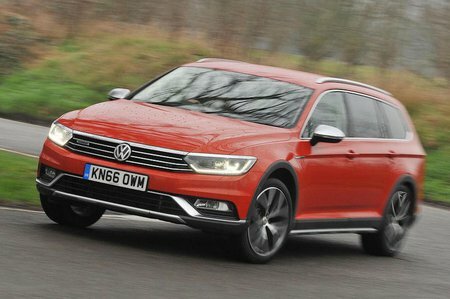 Only over particularly craggy roads does the Alltrack become fidgety, although the 19in wheels of our test car wouldn’t have helped. Whichever mode you pick, the handling is safe and secure but not at all exciting. That said, the slightly numb steering is precise and it isn’t at all unpleasant to drive. As for off-road ability, it copes well with slippery surfaces but is limited by its height off the ground and road-biased tyres on the really rough stuff.